Max. Height above ground: 65ft. 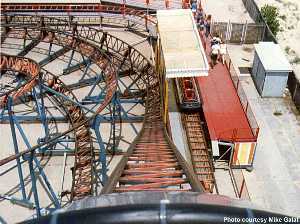 Maximum track slope: 60°, Lift hill maximum slope: 25° (straight and curved). Special track elements: Banked Curves, Banked Helix. Other info: Cheaper than other types of roller coaster, but can't be built as tall. Maximum Ride Capacity: 30 guests, Vehicle Capacity: 2 passengers per car. Maximum Ride Capacity: 25 guests, Vehicle Capacity: 2 passengers per car. Maximum Ride Capacity: 12 guests, Vehicle Capacity: 2 passengers per car. Maximum Ride Capacity: 18 guests, Vehicle Capacity: 4 passengers per car. Limited to single train operation.